Covers Decoration Hire | Outdoor Wedding Ceremony Planning Questions Answered. Outdoor Wedding Ceremony Planning is crucial for the smooth execution of this special and formal part of your wedding day. This list of 10 questions and answers will give you some things to consider when planning YOUR ceremony, making this process easier. 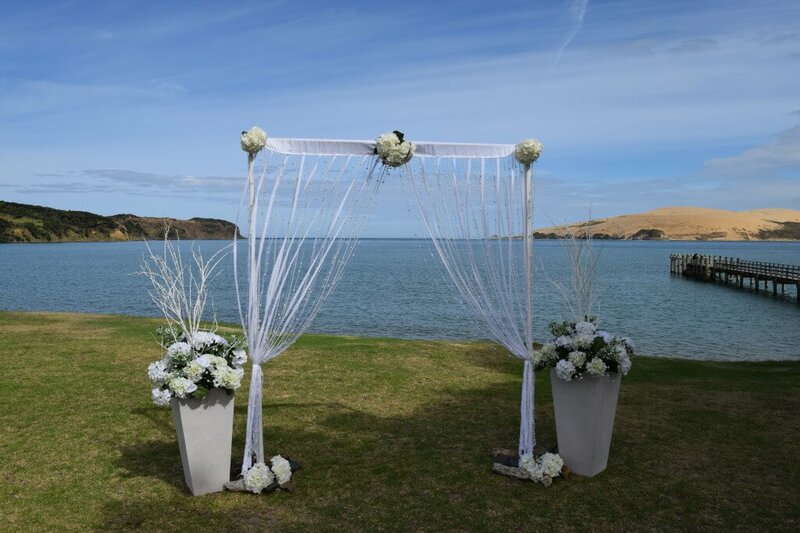 Yes we all dream of the perfect outdoor wedding – blue skies, gentle breeze, perfectly manicured grass or golden sands – some of it we can control, parts we cannot. Plan, Plan and more Planning will ensure the parts you can control are taken care of as for the rest – yes weather, it will be what it will be. Can I use rose petals? Check with your venue if they are happy for you to use fresh petals/faux petals depending on your preference. Outdoor venues often prefer fresh biodegradable rose petals. Silk petals may need to be picked up, and that’s no fun. Who and how of notifying your guests of any change of ceremony location? Set up a group email of your wedding guests so notifying them all, is one quick email regarding the changed location. Remember to advise them on your invitations to check their emails if the weather turns bad on the morning of the wedding. How will your guests access your remote and private ceremony location? Can a vehicle drive the older ones on the beach, through the bush, will your guests be best in jandals or heels. Wanting a Beach Wedding? Remember to check the tides well in advance of printing those wedding invites unless you are planning on your guests paddling in the waves. Food and alcohol restrictions – check your booked outdoor area for conditions regarding serving alcohol and food after the service. Who will Pack Down? You can arrange for either your guests or specialist décor companies like Covers. Do you really want your guests to be carrying chairs, arches etc. Who will set up the hired chairs, signing table, arch and aisle carpet, for the ceremony? For a stress free start to your big day we recommend you hire set up specialists, like Covers, we go to great lengths to ensure everything is as it should be for the arrival of your wedding guests. Sun / heat. This summer has been wonderful and your outdoor midday wedding on an absolutely beautiful still hot day, will have your guests looking for shade. The hours between 11 and 3 are often the hottest so consider hiring parasols, umbrellas or marquees to the sides or choose an area with large trees.What can my guests do after the ceremony before the reception? What will your guests do while you take off for your wedding photos? Arranging entertainment, light refreshments, games will help the occassion flow.